Drake in the Morning | How Much Snow Does It Take To Cancel School? Alexandr Trubetskoy used data points submitted by redditors to create this map showing how much snow will cause the local schools to close. There are some explanations and caveats you can read at the map page. You know that cities and counties that keep snowplows and salt on hand at all times are better at keeping schools open. I would add that the terrain makes a difference. School busses where I live must climb mountains and negotiate curvy roads, often with no guard rails. Heck, the county school system here will close for flooding, because quite a few rural bridges will be under water (the city system stays open). 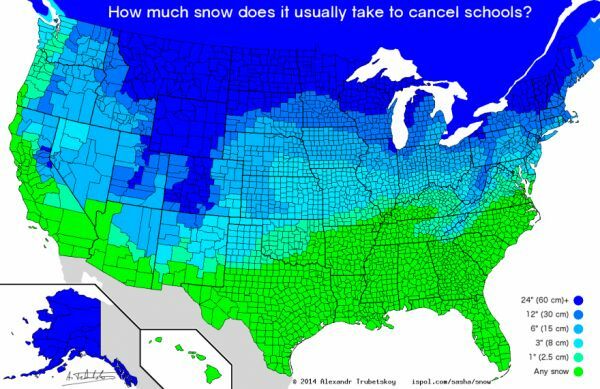 Maybe that’s why school starts in early August in the South, since it’s easier to build in estimated snow days on the school calendar that to pay for a fleet of snow plows that might not be used.